This single wrap is adjustable to fit all types of wrist sizes! 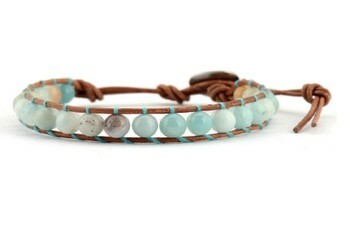 Great for layering with other bracelets! Amazonite is an ancient gemstone that has been prized for its beauty and healing powers for many centuries. Amazonite rock facilitates spiritual healing through its ability to impart a balanced, rational perception of personal truths.